When Christian Petersen-Clausen visited North Korea last year, he was struck by how few people had cellphones. In a world where it seems virtually everyone is now connected by mobile technology, the Hermit Kingdom lived up to its name. But when the China-based photographer returned to Pyongyang earlier this year, phones were suddenly everywhere. 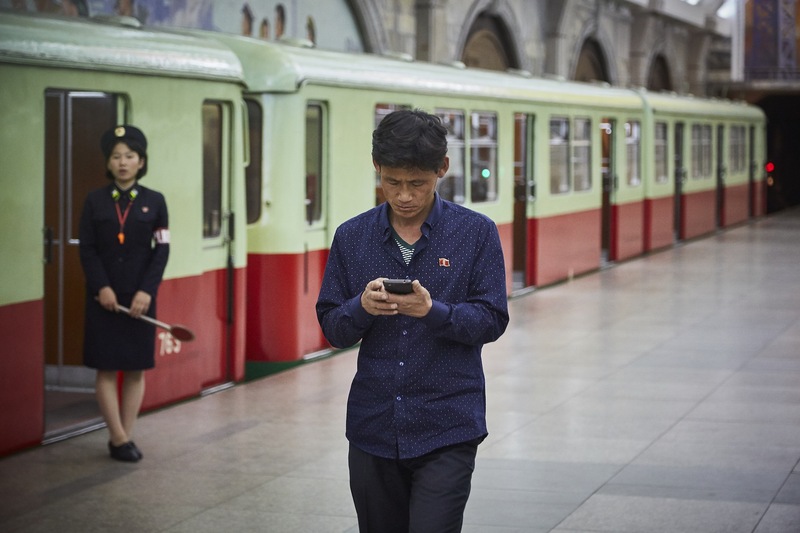 A North Korean man using an Android smartphone inside a Pyongyang metro station. Cellphones are still somewhat of a rarity in North Korea — there are only 2.5 million mobile subscribers in a country of 24 million — but increased phone ownership is just one indication of the personal wealth being accumulated by a segment of the country’s society. 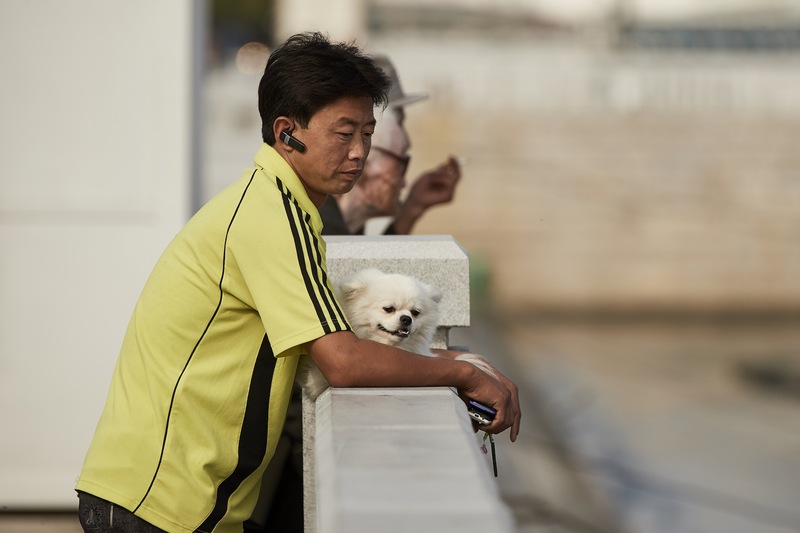 A man holding two cellphones in Pyongyang. These are the people who frequent “Pyonghattan,” the nickname coined by foreigners for a wealthy enclave of the capital that is home to expensive department stores, restaurants, and a 24-hour coffee shop, the type of hangout that is common elsewhere but still trendy and new in North Korea. Two young women using a smartphone in Pyongyang. A North Korean bride and groom pose for photos with a Dalmatian at the Pyongyang Zoo. Madden said these entrepreneurs capitalized on the government’s decision to privatize some state-owned industries, and they’re now reportedly involved in everything from transportation and real estate to sub-contracting for state construction projects. And despite international sanctions designed to prevent North Korea from importing luxury goods, Petersen-Clausen said there appeared to be no shortage of expensive items for the donju to splurge on. He recalled spotting several brand new Audi A6 cars on the streets, and finding flat-screen TVs and designer handbags in Pyongyang’s department stores. Top: A woman takes a riding lesson at the Mirim Riding Club in Pyongyang. Bottom: A stylish young couple in Pyongyang. Though the country’s rich may be getting richer, the photographer said he didn’t have to go far outside of Pyongyang to find the crushing poverty that most North Koreans still endure. He recalled a farm he saw on the way from the capital to the coastal city of Wonsan. All photos by Christian Petersen-Clausen via NK News. VICE News readers can receive $5 off the site’s 2017 North Korea calendars by entering code “vicedonju” at checkout. A woman walks near Taedongmun Park in Pyongyang, North Korea. A man holding a leather bag exits a taxi near the Okryu Bridge in Pyongyang. Two university students review an image on a Canon Powershot A3300 digital camera. Two young men look at a computer monitor inside the Science and Technology Center in Pyongyang. A man wearing a bluetooth headset rides a bicycle in front of the East Pyongyang Grand Theater. Until recently it was difficult to spot well-fed men like this gentlemen, who is attempting to hail a taxi, on North Korean streets. A North Korean woman being brought to her train to China by another North Korean woman at the Pyongyang Railway Station. Snacks for sale on a platform at the Pyongyang Railway Station.